This feel-good picture book assures kids there's plenty of love to go around-the-clock. This is a book that is generous with love, and full of the sweetest illustrations you've ever seen. It is suitable for children age 5 and under. When is it time for a hug? Anytime! 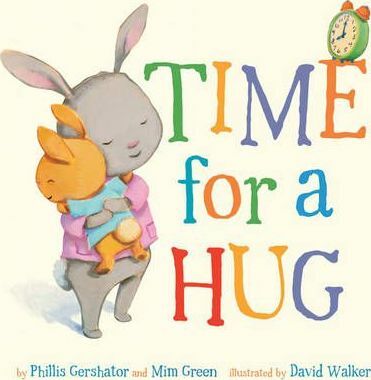 This feel-good picture book assures kids there's plenty of love - a caring hug always feels just right. This is a book that is generous with love, and full of the sweetest illustrations you've ever seen. "Gershator (Moo, Moo, Brown Cow, Have You Any Milk, 2011), in collaboration with her mother, offers this sweet, brief rhyming tale celebrating hugs at any hour of the day. Phillis Gershator has written many picture books for children. Her mother, Mim Green, inspired this collaboration, and the two have also cowritten Who's Awake in Springtime? (Henry Holt), which Booklist called "A playful and inviting bedtime tale." David Walker is the illustrator of numerous children's books, including Before You Were Mine (Putnam), Crocodaddy (9781402744600) (Sterling), and Bears on Chairs (Candlewick). He can be found painting in his studio in Chapel Hill, North Carolina.